What is Binning good for? In unbinned imaging, the signal from each pixel is associated with a given amount of read noise. For instance, 4 pixels would be associated with 4 separate read noise events, since each pixel is read individually. Binning is a procedure in which several pixels are grouped into a function unit, which has the effect of reducing the impact of read noise on the signal to noise ratio (SNR). In 2x2 binning, for example, an array of 4 pixels forms a functional "superpixel," accumulating the same signal as 4 individual pixels, but associated with only 1 read noise event (since the entire superpixel is read out as a unit). However, the larger functional pixel size with binning results in lower resolution of the final image. Below I express these concepts mathematically and derive some illustrative graphs of the effects of binning at a dark site and at a light polluted site. If you are not interested in the math, just skip to the summary discussed in point #2 below. Another excellent site that explains these concepts may be found here. where K is the total (cumulative) exposure time, tsub is the subexposure duration, Obj is the object flux in e/pixel/min, Sky is the sky flux in e/pixel/minute, and R is the read noise in e RMS. Compared to just one pixel, the signal is obviously 4 fold greater since we are now collecting light over an area of 4 pixels. But notice something important about the noise. The noise increases, but this is due only to the increased contribution of photon noise, not read noise (note the yellow parentheses). This is the power of binning, since the read noise contribution does not increase, even though 4 pixels are being read out. They are viewed as a unit. More on this topic can be found near the end of the page on this informative website. Notice that it's the same signal (i.e., 4 fold greater than one pixel), but look at what's happened to the noise. Since each pixel is being read out, the entire noise component (photon plus read noise) is increased 4 fold (note the yellow parentheses). Graph of binning at a dark site. Conditions are stated in the figure legend and include a total (cumulative) exposure time of 6 hours for both curves. Dark site in this example is defined as sky flux = 5 e/pixel/minute. The exact number is not as important as the principle illustrated by the shape of the curves. Graph of binning at a light polluted site. As above, conditions are stated in the figure legend and include a total (cumulative) exposure time of 6 hours for both curves. Light polluted site in this example is defined as sky flux = 100 e/pixel/minute. The exact number is not as important as the principle illustrated by the shape of the curves. 1. 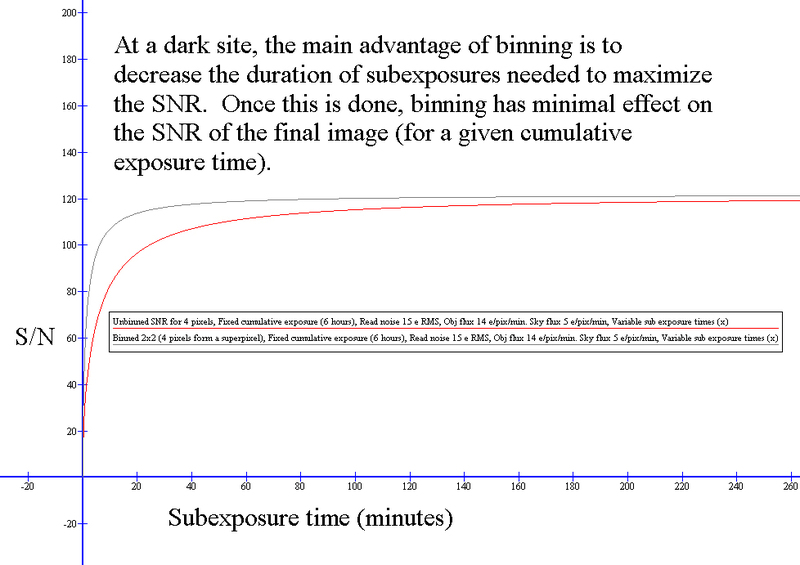 Binning is mainly useful for reducing the subexposure duration, but this is relevant only if you feel that the calculated subexposure duration (unbinned) is unacceptably long. This might occur, for instance, when imaging at a dark site, using a high read noise camera, a narrowband filter with a tight bandpass, and/or a high f ratio. However, if the noise contribution from sky glow is already dominant in your subs, reducing the effective read noise contribution with 2x2 binning will have very little effect. For instance, if you have a low read noise camera and are taking a luminance image at a light polluted site, your calculated subexposures will typically be quite short, and binning would provide little advantage but will compromise resolution (image scale at 2x2 binning is twice that of unbinned, etc.). Also, note that binning will not appreciably improve the final signal to noise ratio of the cumulative exposure, assuming that your subs are photon limited. 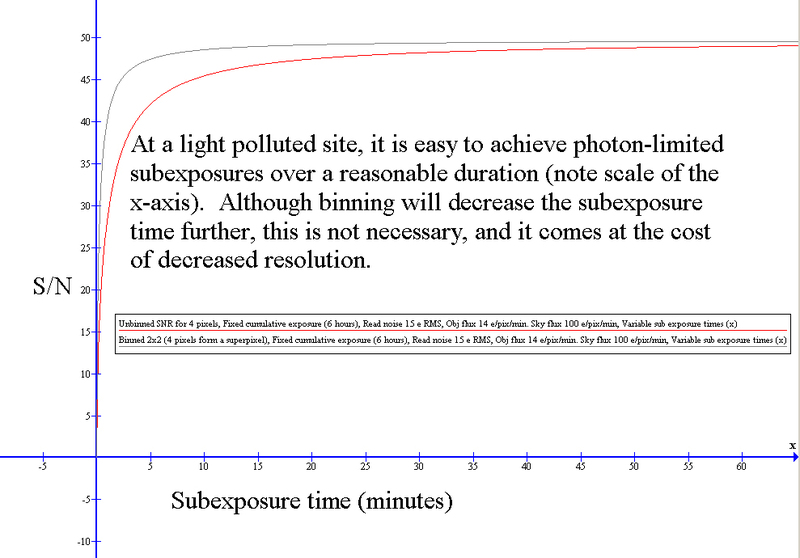 For photon limited subs, an upper limit on the S/N ratio is imposed by the equation shown in line 8 of my subexposure duration page. The downside of binning is a reduction in resolution if your unbinned images are already undersampled (or borderline undersampled). So only use binning if you are very well sampled to start with, and if you feel the need to shorten your subexposure duration due to the reasons mentioned above. On the other hand, if your calculated subexposure durations (unbinned) are within a perfectly acceptable range (however you wish to define that, based upon your mount, accuracy of polar alignment, and patience), then you do not need to bin. 2. The other use of binning is to achieve an image scale that is more realistic for the seeing conditions. For instance, if your image scale unbinned is 0.3 arcsec/pixel, but if your seeing is at best 2.0 arcseconds, then you are wasting effort by imaging unbinned (i.e., you are oversampled, resulting in decreased sensitivity without a gain in resolution, and at the same time placing more demands on your mount and guider). This is because an unbinned image scale of 0.3 arcsec/pixel represents a sampling rate appropriate for seeing conditions of roughly 0.3 x 3 (Nyquist), or about 0.9 arcseconds. You can't resolve 0.9 arcseconds if your seeing is 2.0 arcseconds. Binning can be very helpful in this situation. If you bin such a system 2x2, the image scale becomes 0.3 x 2, or 0.6 arcsec/pixel. This is appropriate for a seeing of roughly 0.6 x 3 (Nyquist), or about 1.8 arcseconds, which is now well matched for your seeing of 2.0 arcseconds. Your images will not suffer any loss of resolution compared to the 0.3 arcsec/pixel image scale (because seeing is the limiting factor), but your system will be more manageable from the standpoint of autoguiding and file size.